Present state: The station house is in private occupation and is largely unaltered apart from a timber extension in front of the booking office. The track bed has been infilled up to platform level and is now a lawn. 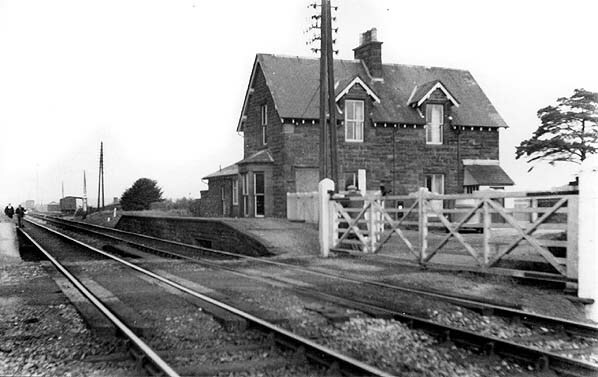 The station had two short platforms with a two-storey stationmaster's house facing the road, and a single-storey booking office and waiting room facing onto the platform on the up side. A signal box at the south end of the up platform controlled the level crossing and access to the goods yard which was sited on the up side north of the station. The box was relocated to the south end of the up platform on 1 March 1914. The yard comprised a single siding with a loop, but no goods shed. 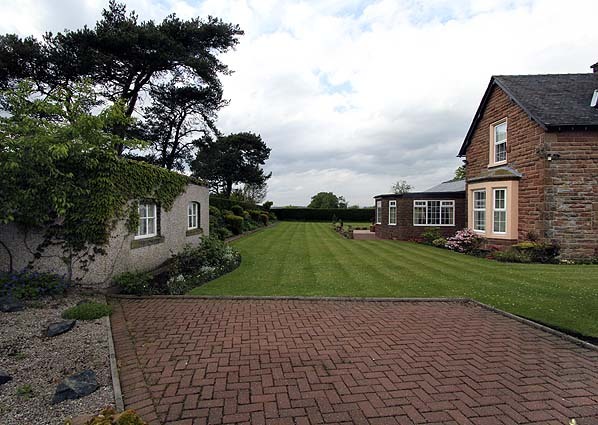 A weighbridge and weigh office stood alongside a separate access road from the public road. The station did not serve any community. 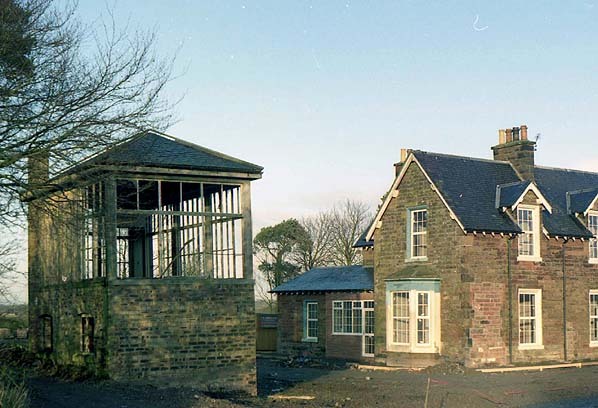 West Linton is no more than a few houses, and the station - never busy - was an early candidate for closure, losing its passenger service on 1 November 1929. The goods yard remained open for the movement mainly of agricultural produce. By the 1950s the platforms had been shortened. The up platform was little more than the length of the building, and the down platform with the signal box was of similar length. A public footpath follows the track-bed north for just over a mile from Lyneside station. some alteration to the course of the line was made between 1838 and March 1844 when the NBR produced a map showing its plans for route. The line was subsequently converted to standard gauge and doubled, reopening to Dalhousie in July 1847. The stations at Cairney, Sheriffhall and Lasswade Road were not reopened. At Nationalisation almost the entire Waverley route was given to the Scottish Region, of which 16 miles were within Cumberland (England) from Kershope Foot to Harker inclusive. In 1959 the London Midland / Scottish regional boundary was adjusted to be a little south of Riddings, transferring Longtown and the closed Scotch Dyke stations to the LMR This arrangement still allowed the Langholm branch to be directly connected to the Scottish Region at Riddings Junction. LM totems were fitted at Longtown and Scottish ones at Riddings Junction (and the three Langholm branch stations), Hawick, Melrose, Galashiels, Stow, Fountainhall, Heriot, Tynehead, Gorebridge, Eskbank & Dalkeith. Until closure LNER nameplates were retained at Riccarton Junction and St Boswells. Bradshaw from Chris Totty, ticket from Michael Stewart. route map drawn by Alan Young. Lyneside station looking north c. 1940s before the up platform was shortened. 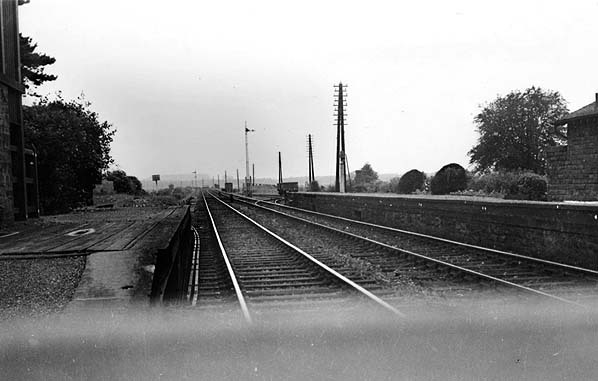 Lyneside station looking north in October 1951. Compare with the picture above; the up platform has been shortened. 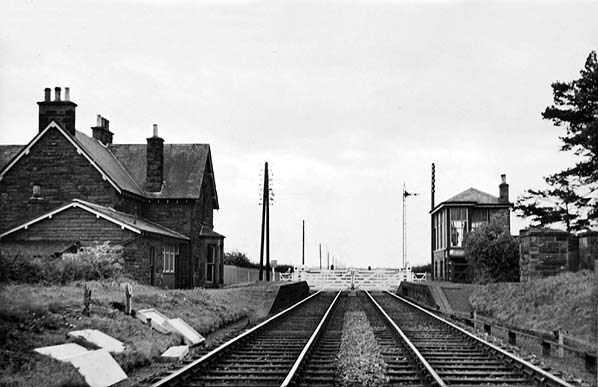 Lyneside station looking south in September 1953. The platforms have been shortened, presumably to serve just the station building and the signal box. 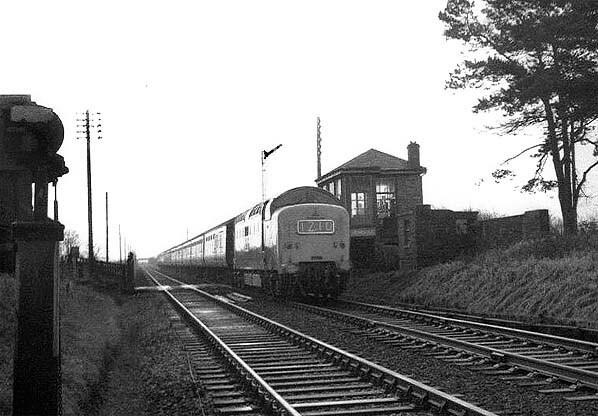 Lyneside signal box in the 1960s. The 1Z10 11.5am Newcastle - Edinburgh commemorative special passing through Lyneside on 4 January 1969, hauled by Deltic D9002 ‘The King’s Own Yorkshire Light Infantry’. 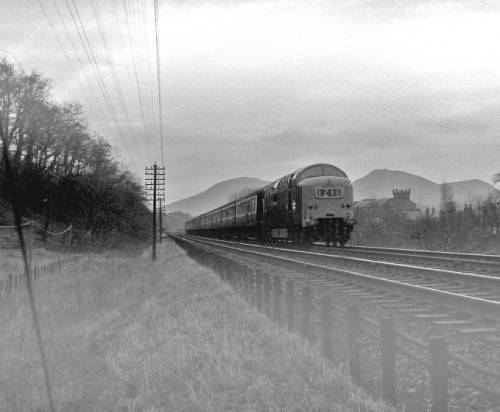 The special ran via Carlisle and Hawick, returning home on the ECML. 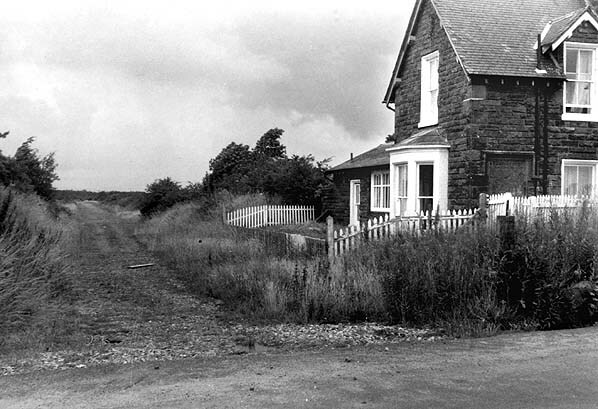 Lyneside station looking north in July 1975, three years after track lifting. 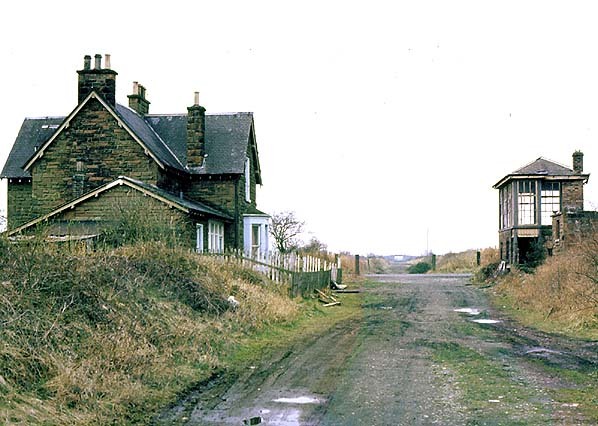 Lyneside station looking south in April 1978. 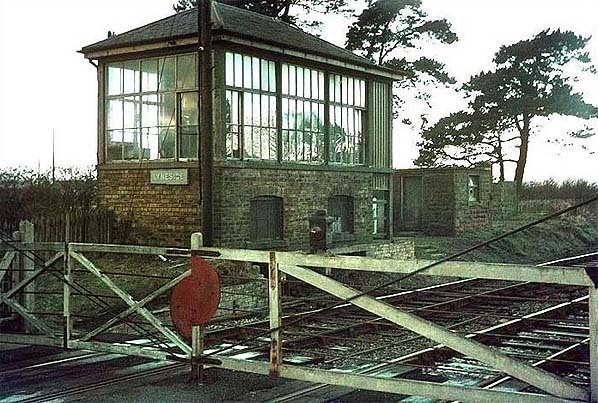 Lyneside station and signal box in December 1989. Lyneside station looking north in May 2011.